We provide consultancy services, training, auditing and system management for a wide variety of industries. 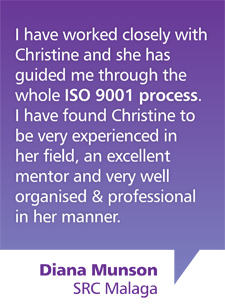 With extensive experience in ISO 9001, Potential Unlocked offers expert support through the entire quality management design process to compliance. Potential Unlocked has many years of experience in working with organisational management and staff to develop systems to ISO 9001 requirements. We are able to work with you through the complete process to achieve your assigned objectives. Why choose to work with Potential Unlocked? We can help you identify and address gaps in your operational processes, develop appropriate policies and procedures and simplify management structures. This will lead to reducing problems that repeat themselves in your business. You will increase your potential for winning more contracts, increase existing and future customers' confidence in you, and increase the value of your business. Why are our typical clients? Our clients range from small business to start-ups to large organisations and government departments. Covering a broad range of industries, our clients include Boral, BAE Aerospace, Geobrugg, Tenix, Western Australian Police, the Victorian Ambulance Service, Airey Taylor Consulting, and Diverse Tank Engineering. We provide consultancy services, in-house training, auditing and system management over a wide variety of industries, both within Australia and internationally. 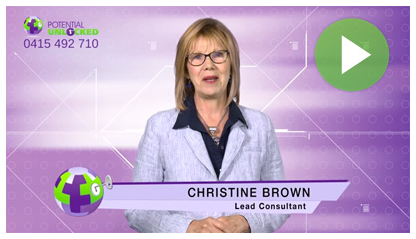 Meet with our Managing Director Chrstine Brown, for a free 30 minute consultation. We provide customised services to clients. We provide expertise to clients wishing to implement a formal management system in compliance with ISO 9001 and other regulatory/statutory requirements. 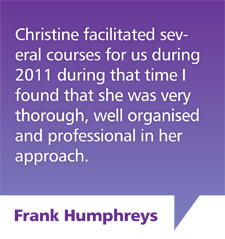 We are interactive and practical in our approach, resulting in a whole organisation understanding. 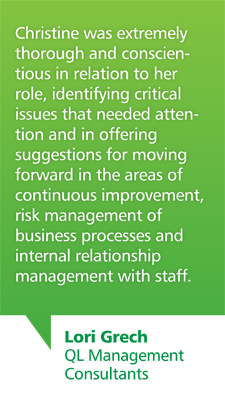 We have extensive experience in performing internal audits. Contact Christine for a Free 30 Minute phone or in-person consultation.